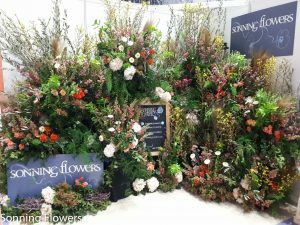 Last month we were privileged to exhibit at the National Wedding Show. It was an absolutely magical weekend, with over 250 other wedding suppliers all sharing inspiration and ideas for weddings of all shapes and sizes. Not to mention a showstopping catwalk featuring thousands of dresses from all the leading designers. You couldn’t help but be inspired. But you know that – you were there. And we hope you enjoyed it as much as we did. Here is a photo of our stand showing a range of wedding flowers for spring. If you would like to visit The National Wedding Show here are their Autumn dates. It might not feel like it right now, but spring is just around the corner, and with it comes a whole host of springtime weddings. At Sonning Flowers we love a spring wedding. Not just because the sun shines and the birds sing as you say your vows, but because it opens up a great range of seasonal spring flowers for your bouquets, boutonnieres and venue decorations. Whether you’re looking for soft romantic pastels, bright pops of colour or deep berry tones, spring flowers have it all. We’ve put together a couple of examples of our favourite springtime wedding flowers to give you some inspiration. Just click here to get inspired. Planning your wedding is a very long, personal process, and sometimes it can be hard to visualise everything coming together and what it will look like. We want to change that. If you’re planning a wedding, you’re invited to join us at our Wedding Open Day, where you will be able to see the latest flower trends, discuss your ideas, see how different colours and flowers work together, and find out what flowers will be in season on your wedding day. To RVSP, just click here. Firstly, thank you to everyone who visited our stand! We loved getting to know each and every one of you, and learning all about your upcoming wedding plans. 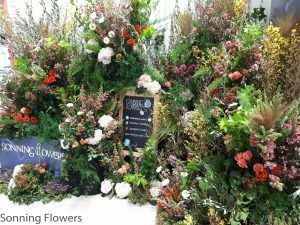 You might have noticed that we were also running a competition on our stand, with a grand prize of a faux flower archway in beautiful ivory and greens for your wedding day. Over 110 of you entered the competition, and we want to thank everyone for that. But there can only be one winner. Her name was drawn shortly after the show, and she has been contacted about organising her prize. If you haven’t heard from us, then unfortunately you didn’t win this time. Of course, that doesn’t mean that arch couldn’t be yours. 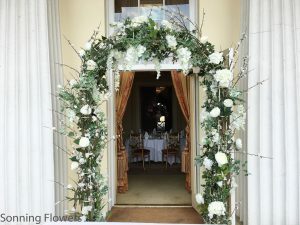 Our stunning faux flower archway is available to hire for your big day, with tumbling vines, realistic silk ivory flowers and full on-the-day setup. If you loved our archway, please just get in touch and see if it’s available on your special day.